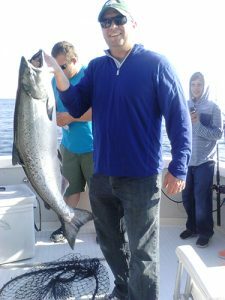 Aboard the Sea-Drift Charter Boat, you will be catching Coho Salmon, Chinook Salmon, Brown Trout, Lake Trout, and Rainbow Trout. 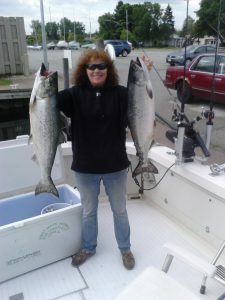 All trips come with cleaning, bagging, and freezing of fish until you are ready to leave. The Lynn A Charter charter fishing boat is a 35′ Bertram. 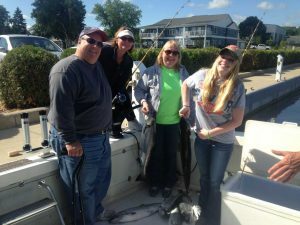 The charter boat is equipped with all options necessary to give the most comfortable and safest fishing or cruising trip you have ever had. 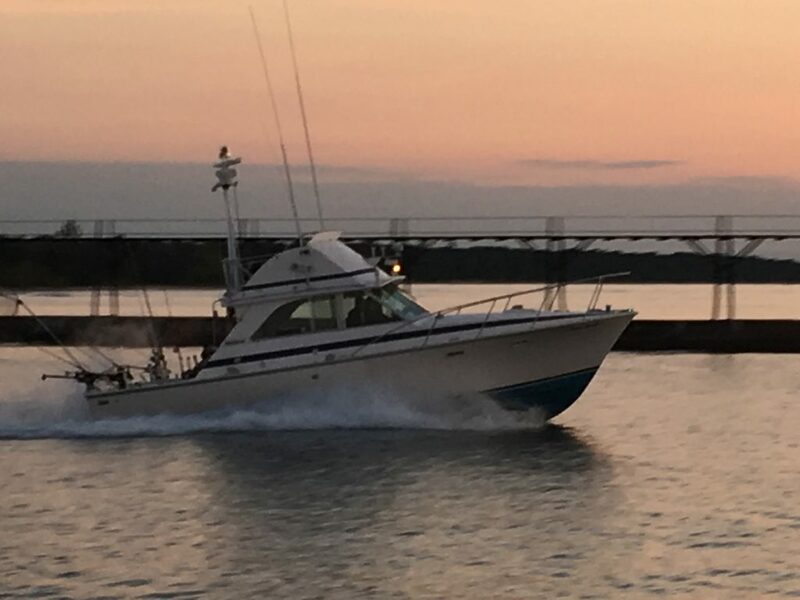 The Sea-Drift charter boat includes the forward anchor pulpit, is 35 feet 6 inches long, and has a full 12-foot wide beam to give comfort and stability beyond belief. 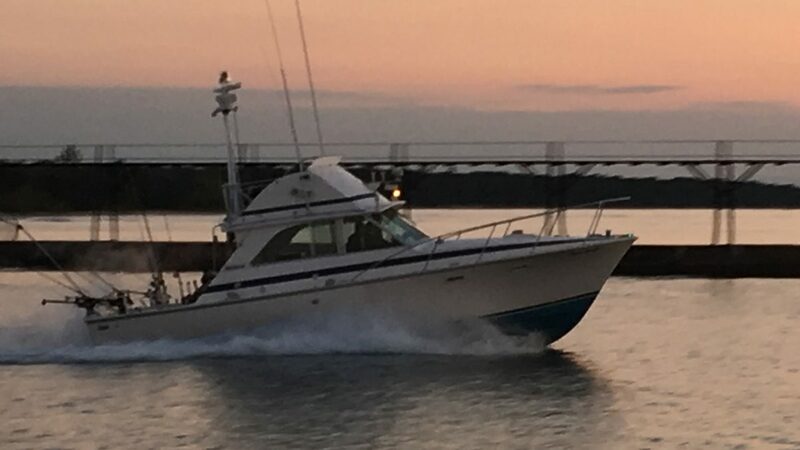 The twin chevy 454’s produce 700 horsepower and will take you far out on Lake Michigan and back with safety and speed. The seating provided will give all six passengers plenty of room to sit and ride in living room comfort. The interior details include over six feet of headroom, a starboard settee/dinette, and accompanying galley, with a microwave and two burner stove. There also is a refrigerator to keep your refreshments and lunch cold and a sink to wash your hands after catching a fish. There is a stand-up or sit down head with power ventilation as an added convenience feature. A full hardtop covers the helm area to let you get out of the sun. The Sea-Drift charter boat is U.S. Coast Guard licensed and approved, and has fire extinguishers and life vests onboard, which are easily accessible to every passenger. The Sea-Drift boat is well equipped with a fully integrated RAYTHEON electronics system. In addition to the electronics above, the Sea-Drift has a Cetrek 730 Autopilot. This electronics system will give our crew the ability to navigate to and from any location on Lake Michigan in an accurate and safe manner. Rain or shine, fog or clear skies, you will be safe on the Sea-Drift Charter boat. 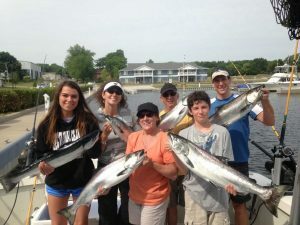 With the use of these electronics features, our crew will have more time to spend with you and help you catch more fish or just enjoy a cruise on beautiful Lake Michigan. 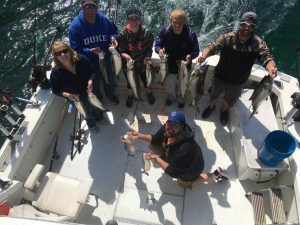 The Sea-Drift Charter boat has Lee Outriggers, which will spread our lures far out from the noise of the engines, and into the path of the fish viewed on our side looking Raytheon 750 Fishfinder. We have four Cannon Magnum 20 downriggers. Onboard we also have a Fish Hawk Temp Troll. This device will show our crew the speed and temperature, at the lure as well as the surface. 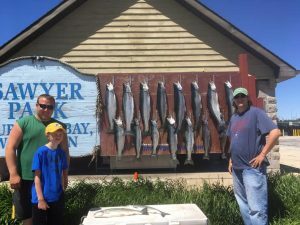 The Sea-Drift boat also has the ability to use many other depth control devices used on Lake Michigan to deliver lures where the fish are biting. 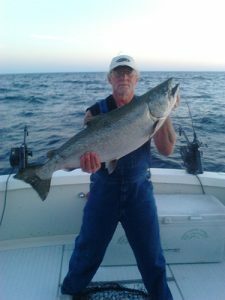 All necessary fishing equipment, VHF marine radio and cellular phone, USCG approved life jacket and other safety equipment, AM/FM stereo and compact disc player, State of the art navigational electronics, fish finders, temperature sensing instruments and downriggers, fish cleaning per your specifications. An Action Packed Lifetime Experience.